It’s a sad truth that many young people today have not been taught how to handle money. Quite a few of them, in fact, are unable to count back change when they need to, such as at a job. But why are our youth not learning these fundamental life skills? For one thing, schools may be relying on parents to teach money management skills while the parents rely on the schools to do it. Neither one is making sure the children learn what they need to survive once they head out into the world on their own. Therefore, our young people can’t manage the simple tasks of balancing their checkbooks, budgeting their money, our counting back change when they need to. Clearly change is needed. But if you intent to fill that gap in your own family, what should you teach your kids about money? One of the first things you should teach your kids about money is how it is earned. From a young age your children need to learn what it is you do to pay the household bills. Tell them about your job and what you do each day to earn a paycheck. Keep it brief and general for very young children. If your kids are older, however, you may be able to provide a little more information. For example if you are a nurse, you might tell young kids that you help sick people to get well again at your job each day. When your kids get older you can tell them a little bit about taking blood pressures, giving medications, administering shots, and various other duties. It’s important that children know how money is earned so they can better understand how job skills and education impact jobs and income. They must also understand the value of money, which is another reason they need to know how you earn your income. When my kids where somewhere around middle school to high school age, I bought one of those paper money and plastic coin sets. Next, I set up different scenarios where they had to “buy” something from me using the fake money. Sometimes they didn’t have the exact amount, so I gave them change. It was up to them to tell if I gave them the correct change or not. Of course, at times I had them act as cashier too, making them count back change. As teenagers sometimes do, they rolled their eyes and got a bit impatient with me. But when my high school age daughter was the only person at her fast food job who could count back change correctly I knew I was onto something. 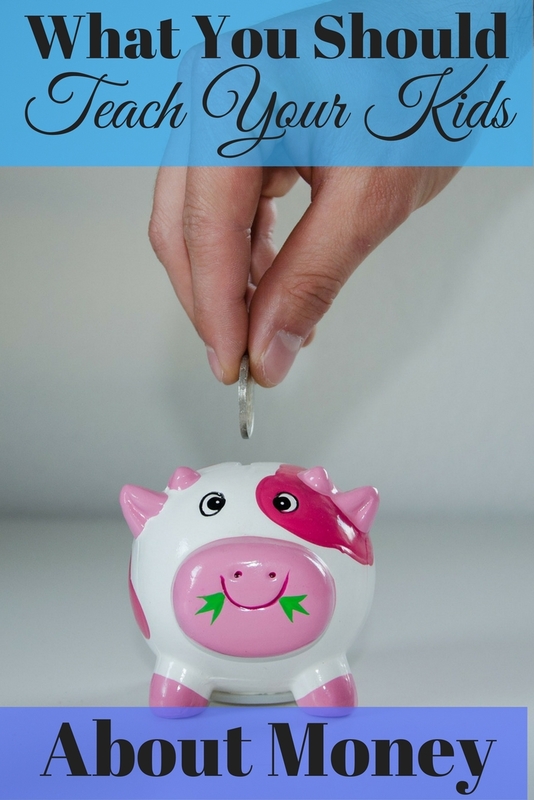 Something else you should teach your kids about money is how to budget it. Again, you could set up different practice situations, or just show them how you budget instead. Start out by letting them help you stuff envelopes and put on the stamps when they are young. As the mature into middle school and high school they will be ready to see how you budget, pay bills, and file paperwork. Show your kids how much you put away in savings each month. They don’t need to know the total amount you have in savings if you don’t wish to share that information with them. Nevertheless, instill in them the importance of saving a portion of what you make each month. Let them know why you save, such as for an emergency fund, vacation, or college education for their future. When they know why it is important to save they will be more likely to save also once they are out on their own. 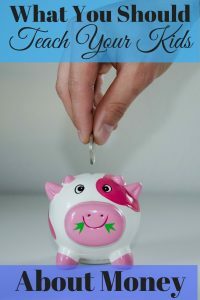 Take it a step further by allowing them to save toward a goal they have, such as paying for a new toy or game they want. Give them chores to do around the house and pay them for those they do well. Then, once they reach their goal, take them shopping for the item they saved up for. Another thing some parents forget to teach their kids about money is why investing is essential. If you have any investments, even if it is just a 401K, you should let your children know about them. Talk to your children not only about how to invest but why you invest. When they know the reasons why you invest for the future they will have a better grasp on how it impacts them. Instilling financial literacy in our children is vital to their future. Don’t wait on someone else to teach them about money. Teach your kids about money at home and ensure they have the skills they need once they are no longer under your roof. What additional concepts should you teach your kids about money?